This weekend we dropped into the Crane Kalman Gallery in Brighton’s North Laine to check out British photographer Samuel Hicks’ first solo exhibition, “On the Way”. “The … images are from 3 trips to the States over 18 months, driving through Texas, New Mexico, California and Nevada. These trips were essentially quite loose; sometimes we knew we had to be at a specific place in a week’s time, but how we got there and where we stopped was decided along the way, sometimes by looking at the map, or often asking someone what it was like there. 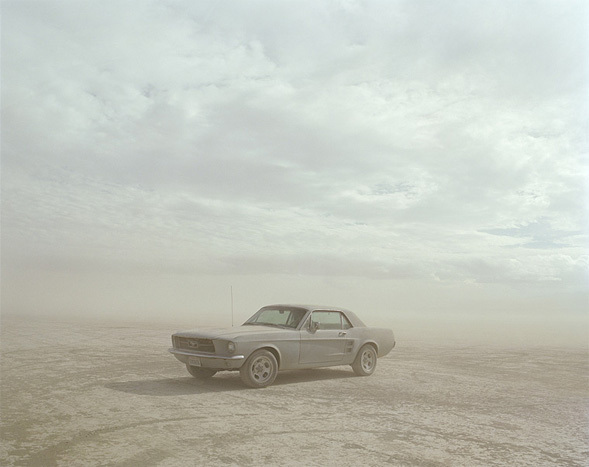 Typically, the photo I loved (Mustang, above, shot in El Mirage, California) was the most expensive. If anyone has a spare £1100 lying around… donations gratefully received. If you can’t make it to Brighton for the show, much of it is available to view online at FOTO8. More images by Samuel Hicks are on his website, samuelhicks.com. On The Way runs from 4th June to 19th July 2009 at Crane Kalman Brighton, 38 Kensington Gardens, North Laine, Brighton BN1 4AL. dConstruct is all over for another year. Highlights for me were the insanely personable Tom Coates and his talk, “Designing for a Web of Data” and Cameron Moll on “Good vs Great Design“. No real lowlights, other than that I wished Denise Wilton and George Oates had a bit of a Q&A at the end of their talk… actually, a bit more Q&A all round would have been nice. Oh, and free coffee during the day would have been cool too. What I really enjoyed, though, was meeting (meatspace social networking?) a lot of lovely like-minded folk. What’s even better is I’ve come out feeling incredibly invigorated and excited about what I do for a living — which really is a superb and unexpected bonus! And the beer was nice too. Actually, I have another low: Because I’m feeling more excited I’m up at eleven thirty on a Sunday finishing off a draft for an antikewl redesign — when I really should be in bed! Brighton and Hove city council is considering installing a free-to-use wifi network covering the whole of central Brighton next year. Interestingly they didn’t approach Loose Connection or piertopier.net who already have a free wifi network covering much of the seafront. Further away from home, Mexico City is also scheduled to become one big wireless hotspot by the end of next year so soon you’ll be able to play Tetris DS anywhere you like. I did this commute from Brighton to London (and back again) by train every single day for around eight years. If I’d had a front row seat like this I’d have probably enjoyed it a bit more. Well, that and if it *actually* took 2 minutes instead of an hour and a half. They really could have cleaned that windscreen though! Back in the 80′s there was a programme on the BBC with time-lapse footage of the trip in 3 1/2 minutes — and it’s also on YouTube, complete with awesome futuristic 80′s soundtrack! Update: I love YouTube! There’s even the original 1950′s 4 minute timelapse footage on there as well. Enjoy! The street in Brighton that I moved out of just 6 months ago plays host to a week-long rooftop art show! 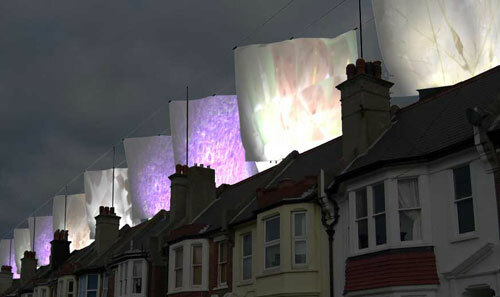 If you want to see it for yourself the installation will last for one week with 6 showings a night from 7:30pm until 11pm on the rooftops of Compton Road, Brighton from the 16th until 23rd September 2006 and will be visible from the valley area around Preston Park and Fiveways. Visit the Compton Skyline website for more information. Sadly, I’m out of town for much of the duration but hope to catch the final show before it’s taken down on the 23rd.